I had the privilege of working as an organizing assistant on the A&E show Hoarders. If you have not seen it, here is the scoop. Each 60-minute episode of Hoarders is a fascinating look inside the lives of two different people whose inability to part with their belongings is so out of control that they are on the verge of a personal crisis. This week an upcoming episode that was filmed in Houston is being shown. The air date is February 1. Working as an assistant to Certified Professional Organizer – Chronic Disorganization Geralin Thomas www.metroplitanorganizing.com and Clinical Psychologist Suzanne Chabaud, Ph.D., the episode was filmed for 2 days on location at the home. My kudos to both professionals on their approach to a very real life challenge! Honoring the client’s needs and respecting the client are underlying aspects of Hoarders. The client was facing tough decision making. Dealing with too much stuff can be a shameful experience. From the outset the tone of respect was set. Recognizing the client’s vulnerability, the focus was to help him make decisions and move forward. Others on the set were aware of this and it was clear that the client was anxious about having his things thrown out. Everyone on the set learned about the mental health challenges facing the client in parting with his stuff. And everyone was patient! It took time to make decisions and move forward. Hoarders portrays the work of a certified professional organizer in a real setting and in a realistic manner. It is really about sorting and decision making! Some of the most difficult parts of working with a client is to understand the depth of the decision making challenge and the need to keep items. Seeing the process of grouping “like” items together at the beginning, moving on to decision making, then finding a “home” for stuff, people are seeing how the process evolves. Truly, a client moves forward at their own pace, not the pace set by the organizer or the therapist. In viewing the challenges of those on the show, people are recognizing their own challenges too! This is an incredible way to make a difference in people’s lives. Thank you to both of these professionals for sharing their time with all of us, personally and nationally. What an incredible experience to learn as they worked with the client. What was it like behind the scenes? Really no different than what you see on tv! Everyone was there to help the client live their best life! Here are 10 ways that cut to the chase on organizing and saving money. These 10 ways organizing saves you money will be the best reasons to get organized now. 1. You won’t need to buy things you already have. You won’t have to run to Walgreens to buy your kids index cards or school supplies. 2. You find money in your pockets – lots of it! We found $15,000 in a bin of papers! We have found some money in every home where I work. 3. You get reverse income by donating and using itsdeductibleonline.com. Make a list of what you donate and create a spreadsheet. Each time you donate usually adds up to $500 for tax deductions. 4. Your emotional and physical health improves so fewer doctors’ visits. There are tons of allergens in paper piles, especially dust mites! 5. You prioritize saving money in entering your receipts into Quicken and know where you spend your money. Having a strong connection to your money saves you money in prioritizing how you spend it. 6. You clip coupons and save money every time you are at the grocery or drugstore. Some families spend only $20 on groceries a week with coupons. 7. You keep on top of home repair and other tasks. Prevent big expenditures by routine upkeep of your home and car. Regular maintenance of your car means you can make more money on the resale. 8. You save money on the utilities in your home. Being organized about your laundry means consistently filling the tub, washing the dished regularly with a full load and saving on heating/cooling costs by setting the temp at a consistent level. 9. You keep your purchases to a minimum. Being organized means buying what you need, when you need it, rather than compulsive shopping to assuage your emotions. 10. Everyone knows saving time is saving money. You can be more efficient and effective at everything you do by being organized! 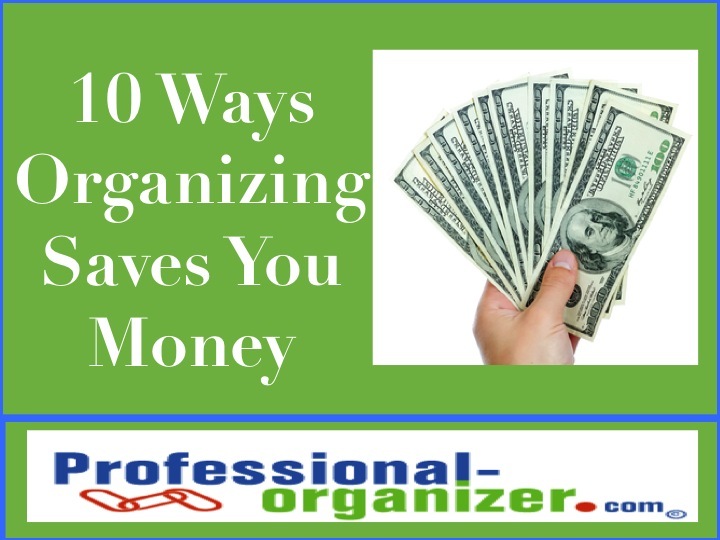 How does organizing save you money? Is getting organized your top new year resolution? Here is the easiest way ever to get started! Offered under the leadership of my colleague Allison Carter, there is a wide array of classes offered by the top professionals in our field. Join us for this amazing event! Your’s truly is partnering to present information on procrastination! Did you know? · The Wall Street Journal reports the average office worker spends 49 minutes a day emailing, while top management spends about four hours a day sending, receiving and reading email. Ellen Delap and Leslie McKee are both Certified Professional Organizers® and Family Manager Coaches. Together they will address the challenges and causes of procrastination and how to overcome it. Remember, procrastination is a habit not a flaw and Leslie and Ellen will teach you will address the challenges and causes of procrastination and how to overcome it. So if you are putting something off that is getting in your way join their call and be on your way to a more productive 2010! Learn from the comfort of your own couch. PS Dont procrastinate on this offer! Use the code word clutter for 10% off! Moms wonder about all the papers and more that come home from school. Keeping up with your kids precious keepsakes cam be overwhelming. There are so many scribbles, cut outs and holiday artwork. Setting up good systems and routines make it easier to keep control. What defines “precious” for every mom is different. Is it the first spelling test with 100? Or is it darling art work? I help clients define what is precious. Something that is totally unique to that child, such as a handprint, a written story or a painting, is precious to me. It is easier to assess what to keep by collecting the items for a month in an easy to access basket. At the end of the month, have your child go over the items in there, having them share all about the work. Here are lots of great ideas once you have decided what to keep. 1. Take a photo of the keepsake. 2. Take a photo of your child with the keepsake. 4. Send keepsakes off to grandparents or other special family friends. 5. Use the keepsakes for gift wrap. 6. Make a book of the keepsakes. 7. Keep the keepsakes in a large fed ex box by year in the top of a closet. 8. Keep the art in a portfolio under a bed, in the back of a closet. 9. Set up a “clothesline” with 6 clothespins on an wall in their bedroom. This is now the art display area. Rotate art monthly. 10. Put together a 3 ring binder with 50 slip in sheets. Review the papers with your child and have them select one per week for the binder. This is now their precious keepsake and they will have something of pride for themselves too. 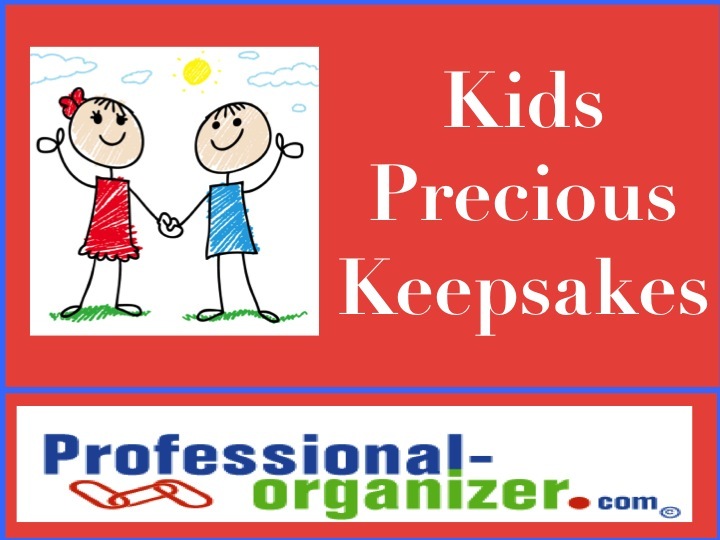 How do you keep your child’s precious keepsakes? According to ABC13 in Houston, the top newyear’s resolution is to spend more time with your family. As a Certified Family Manager Coach, my passion is making families cohesive, communicative, and nurturing. However, as with all goals, this can be overwhelming and end us with less than stellar success. Let’s break this down into some baby steps to be sure you accomplish this goal! 1. Spend more dinner time together. Whether the goal is one dinner a week or seven, create a plan that works for you and your family. Dinner together can be sandwiches or spaghetti, create a plan that is simple for you and enjoyable for your family. The plan can be a grid of 3 weeks of easy to make dinners with your family input, a technology tool with thescramble.com or e-mealz.com, or assigning family members a night to cook. 2. Spend more quality time together. Create a team and strategically plan for time together. Our world is crazy busy and if we wait for spontaneity our family time may not occur. Set aside a family meeting time once a week with a short meeting and plenty of fun time. During the meeting be sure to chat about upcoming family events. 3. Spend more time learning together. What interests and activities do you want to share? Choose open ended activities that every one can be successful at, including art work, walking, or going to a museum. Celebrate everyone’s strengths by affirming each other and encourage new interests. I look forward to learning from you how your resolution is coming together! The beginning of a new decade brings big goals! Just thinking about one goal is a big step, but 10 goals are …. ? What 10 areas are you focusing on to organize this year? Take one step at a time, organizing one room or thing at a time, and make a BIG difference in your life! 1. Organizing your closet. We put ourselves LAST in making a difference! Take time to organize your closet to feel ready to go in the morning and confident. Keep only the clothes that make you feel FABULOUS, no matter what the size tag is. Once this is eliminated, order your clothes in a way that makes sense to you, by outfit or by pants, tops, etc. 2. Organize your bedroom. Our space is intended to be serene and restful. Is it? This year make your bedroom your serenity zone with no paper, no clutter, and just items that are peaceful and promote great sleep. 3. Organize your laundry room. It make a big difference to get this chore done. Having the right laundry sorter makes the difference. Use a 3 compartment sorter for white, color and towels. Do one load a day, ask for help from your family, and keep it simple. 4. Organize your pantry. Getting dinner done is about having the right ingredients. Toss what is outdated (nothing is worse than food poisoning.) Arrange like the grocery store. Add a magnetic list to the frig so you can add what you need when you need it. Keep staples on hand to make dinner in 30 minutes. 5. Organize your car. Our cars are our offices! Do the pump and dump (thanks Geralin www.metropolitanorganizing.com) and toss trash as you get gas. Ask your kids to help you distribute what comes out of the car right away. Create a landing strip for returns. 6. Organize your purse. You can tell how organized a person is by their purse! Have a command center for papers so you can empty these right away each day. Keep items grouped together, use a wallet you can move to alternative purses, and place your cell phone and purse at an easy access spot in your home. 7. Organize your papers. Create a command center to make your papers easy to access for action, easy to file for retrieval and easy to archive. Need help? See the tips of the season section! 8. Organize your kitchen. We all want time together as a family. The magic of meal time is to gather to communicate and have fun. Organizing your kitchen makes this happen. 9. Organize your calendar. Choose a calendar you love, either paper or technology. Use it daily – refer to it, enter items right away, carry it all the time. Once a week have your weekly planning time to get proactive! 10. Organize your time. Life is about our priorities. Think through what you are committed to and be sure you are able to fully commit. There are zillions of options so live a meaningful and purposeful life by making decisions. Take one idea and carry it through for one month! You will be amazed at the difference for yourself and your family. Let me know your first step on organizing!